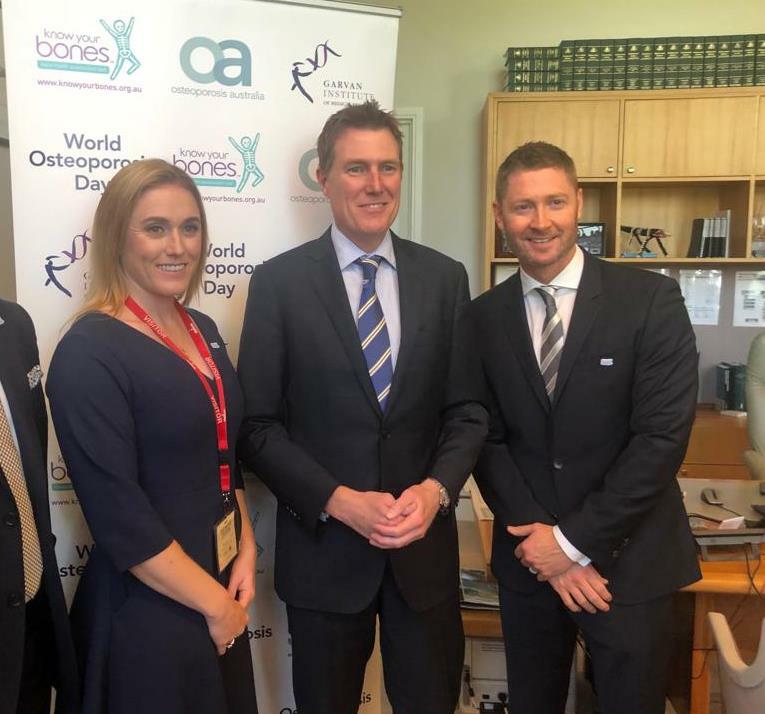 Federal Member for Pearce, Christian Porter, Olympic Gold Medallist and World Champion Hurdler, Sally Pearson OAM and former Australian Cricket Captain and World Cup Champion, Michael Clarke, are encouraging residents of Pearce to Know Your Bones as part of World Osteoporosis Day (20 October 2018). Mr Porter said more than 31,000 people in the electorate of Pearce have poor bone health, according to Osteoporosis Australia. “It was great to have Sally and Michael come to Parliament House to help raise awareness of Osteoporosis and encourage residents of Pearce to Know Your Bones,” he said. “Poor bone health can lead to Osteoporosis which makes bones become brittle, leading to a higher risk of breaks than in normal bones, resulting in fractures and in some cases immobility. “Any bone can be affected by osteoporosis, but the most common sites are the hip, spine and wrist. Olympic Gold Medallist, Sally Pearson OAM, said it is very important that Australians are aware of their bone health. “With my own personal history of bone fractures, I understand how important it is to look after your bones. I’d encourage more Australians to use the Know Your Bones online self-assessment tool. “I also encourage anyone with concerns about their results to talk to their GP. Former Australian Cricket Captain, Michael Clarke added that a calcium rich diet with foods such as dairy, certain vegetables, fruit and nuts also helps to maintain your bone health. “Looking after your bones is important for young people as well as men and women to reduce the risk of osteoporosis which can lead to broken bones,” he said.